In all probability Etim Richard Ekeng Henshaw is a name few of our readers are familiar with. 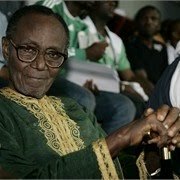 To learn that he died in the city of Calabar, the capital of Cross River State, Nigeria at the ripe old age of 89 in November last year may still not ring any bells. 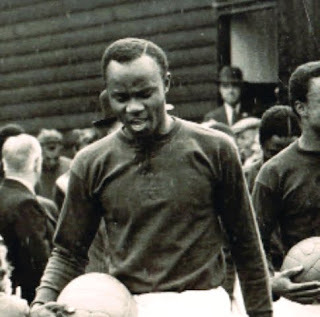 However, this man played an important role in the history of the Nigerian national football team, and one of their earliest matches was against Dulwich Hamlet at Champion Hill. The son of the ambassador in London, Etim Henshaw captained the first Nigerian FA Select XI. 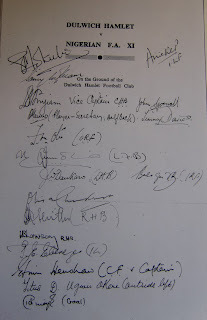 This squad of eighteen was assembled in the summer of 1949, and arrived in the United Kingdom at the end of August to see how they would fare against some of England’s leading amateur teams and representative sides. With post-war Britain still under rations the visitors brought plenty of their own supplements of yams, oils, rice, jam, peppers, dried shrimps and hams. However, the precious cargo was the players themselves. The manager, a white man called Mr Holley, also happened to be the Chairman of the Nigerian FA, and in the short space of a month he undoubtedly learned an extraordinary amount about the playing of the game as well its structure and organization. 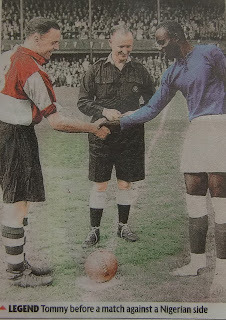 The players, aged between 20 and 29, were made up of two teachers, two clerks, seven railway employees and members of the Nigerian Marine Department, an offshoot of our own Royal Navy. In his hometown, Henshaw led the attack of the Marine FC of Lagos of which he was captain. Some of the other men also played for them. Perhaps it was for this reason that after the party arrived in Liverpool docks, the first opponents they were to face were Merseyside amateurs Marine of Crosby. An impressive display saw the visitors overrun the scousers by five goals to two. They were off to a good start. A journey to the North East for the second game saw them take on Bishop Auckland. Again the score was 5-2, but this time it was a reverse of fortunes. In front of a huge 13,000 crowd Henshaw scored both of the away goals, the first a header and the second direct from a freekick. Picture Post photojournalist Charles Hewitt gained access to the Nigerian dressing room shortly before kick-off. Hewitt was on the top of his game and always got to the heart of his subject matter, saying more in a single picture than can be written in words. His profession had taken him to the working men’s clubs of the north and concentration camps on the continent. He would later take some famous portraits of surrealist painter Salvador Dali. In this particular commission Hewitt focused on the feet of the Nigerians as none of them were taking to the field in regular studded boots. Instead they wore elasticated support straps. Most of the players in the squad of eighteen preferred to play their football in bare feet, although two or three of the players wore baseball boots. 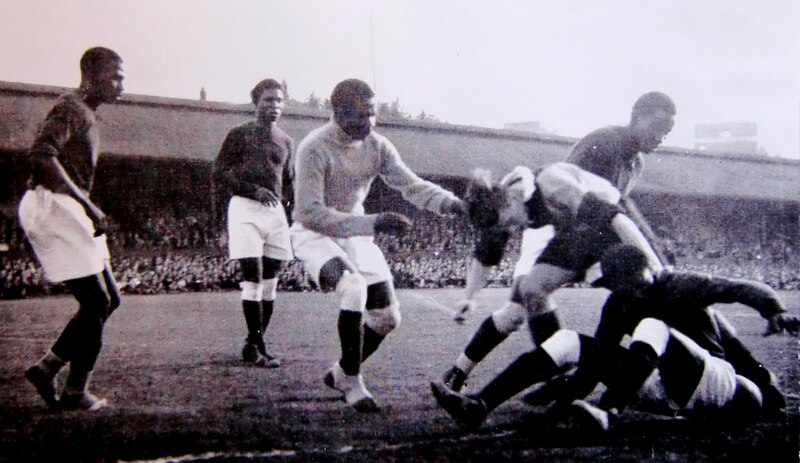 The side included goalkeeper Sam Ibiam, seen here adjusting his ankle straps (4); inside forward Peter ‘Baby’ Anieke and centre half Kannu (9); inside forward Ebenezer refreshing himself under the tap (7); Etim Henshaw, the captain and centre forward reading the paper (12); Lawson treating the soles of his feet with some olive oil (6); Baba Shittu, binding his toe (3); Anieke, receiving a pre- match foot massage (8); Ottun putting on a football sock that has had the foot cut away (5); The team played without boots but wore elastic support straps for their ankles (2, 11, 13). Off the field the Nigerian squad was put in the very capable hands of Andrew T. Ralston, representative of the Football Association, to ensure all the arrangements ran smoothly. 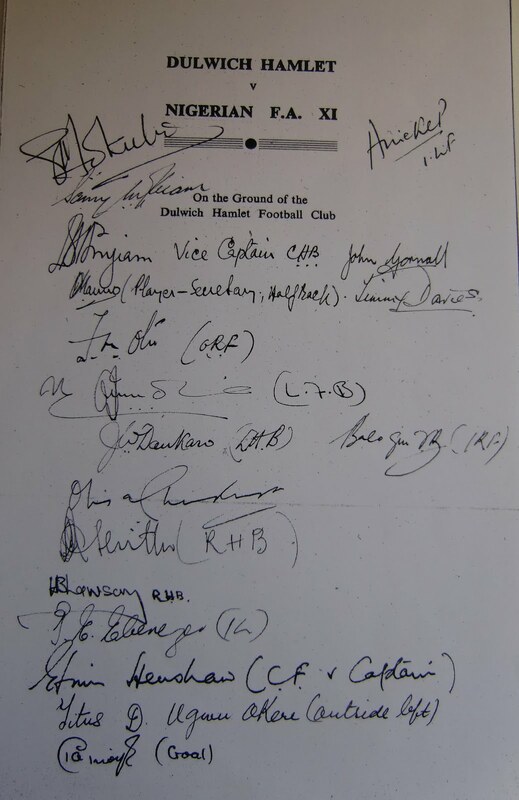 Ralston knew more about the amateur game than most, and in a bygone age as a player and official of the London Caledonians he was a great friend of the Dulwich Hamlet club. His efforts throughout the tour enabled the visitors to train at the Arsenal, Everton and Darlington grounds and attend some top flight First Division matches at Stamford Bridge and White Hart Lane. The major part of the tour took place in and around London. Leytonstone were next met, and then an Isthmian League XI (at Ilford) and a Corinthian League XI. Despite two defeats and a draw resulting, the team were bonding well and showing superb artistry in all quarters. Left winger Titus Okere, oftentimes noted as the fastest man on the pitch, only met his match when he appeared on the same field as the Hamlet’s Tommy Jover of the Isthmian XI. Lawson and Dankaro, a clever and industrious pair of wing-half-backs were proving to be quite a handful, and supplied their forwards with plenty of opportunities in front of goal. The powerful shooting of six foot three inch Tesilimi Balogun, nicknamed ‘Thunder’, was only thwarted by some excellent goalkeeping. Thunder wasn’t the only one with a nickname. Keeping goal for the Nigerians was Sam ‘The Black Magnet’ Ibiam, whilst Peter ‘Baby’ Anieke, an attacking midfielder gifted in the art of volleying, appears to have had two! He was also known as ‘Diamond Toe’. One feature of the English game that might have come as a bit of a surprise was the length of time in which matches were played out. Back home they were used to thirty five minutes each way, a rule adapted to compensate for the African heat. It was little wonder that the players tended to fade with the autumn light in the final fifteen minutes or so. And these were the days before substitutes were allowed to replace those with tired legs. 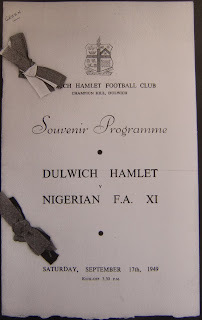 Dulwich Hamlet the reigning champions of the Isthmian League, and the finest amateur club in the south of England, were the sixth team to take on the Nigerians. 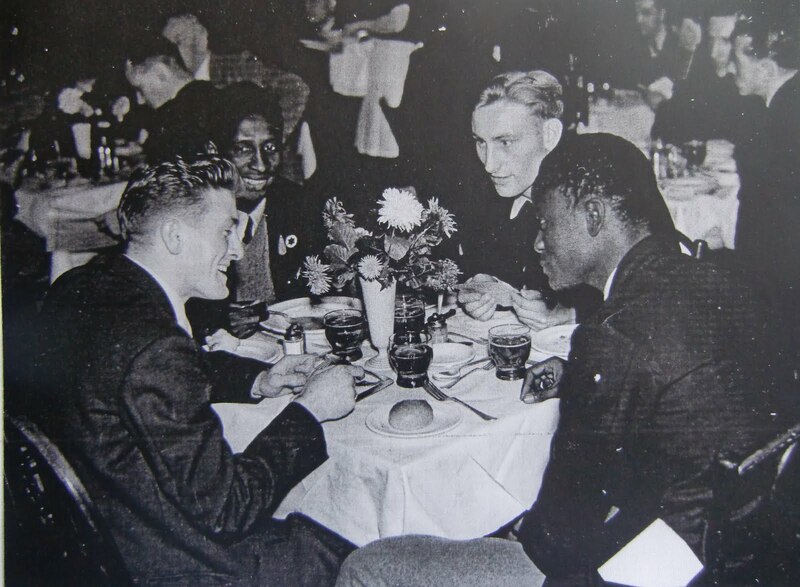 The two sets of players actually met the evening before the game at the Empire Pool Wembley to watch the boxing finals of the Britannia Shield. The Wembley Stadium entrepreneur Sir Arthur Elvin provided ringside seats, and a splendid evening was enjoyed by all. The combination of fine weather and the lush playing surface of Champion Hill made for ideal conditions for a fast entertaining exhibition. One of the best games witnessed at the ground since before the war. 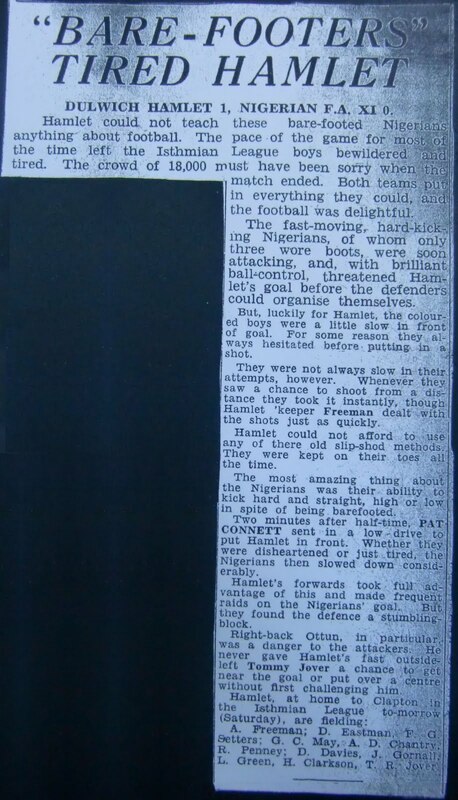 The game produced just one goal, from the Hamlet’s Pat Connett, making it the lowest scoring match of the tour. Both sides missed decent chances and if Henshaw’s speculative shot from outside the box towards the end had brought the equalizer it would have been thoroughly deserved. Henshaw was well known for his powerful long range efforts and it was long debated back home whether he or ‘Thunder’ Balogun possessed the hardest kick. The Hamlet’s Leslie Green takes on the Nigerian defence. The visitors, three in baseball boots and the rest in ankle straps, were delighted at the reception they received from the 18,000 crowd packed inside the ground. It is beyond doubt that many had turned up for the sheer uniqueness of the occasion. 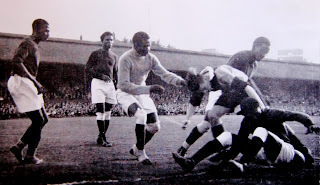 It was still very uncommon to find one black man on an English football field, so to have a whole team of black men aroused much curiosity. By the end of ninety minutes, however, as they left the field, this exceptional group of footballers were treated to a very generous standing ovation. Two versions of the matchday programme were produced for the day. The normal single sheet folded, and a souvenir one for players and officials with the clubs’ colours of pink and blue and green and white ribbons attached. A veritable banquet was held in honour of the visitors at the Grove Hotel just up the road. Proprietors Mr and Mrs Ainsworth served up some traditional English nosh; a real footballer’s dinner, which was greatly appreciated. One of the guests of honour was Sir Leslie Bowker, an FA Amateur Cup winner with the Hamlet three decades earlier. His speech was followed by one from the Nigerian captain Etim Henshaw. There is no record of what he said, but we can be sure it was spoken with charm, modesty and grace. Reminiscing many years later he said that he represented his country with immeasurable pride. The Dulwich Hamlet Football Club was presented with a small banner, and all the players with a Nigerian pin badge as mementos of the tour. Les Green and Don Chantry in after match conversation at the Grove Hotel. My guess is that the badge containing the star on the player’s lapel in the picture is the badge in question. The six pointed star would normally have inside it a Tudor crown, but this may well have been drastically simplified in the manufacture. As would be expected the tourists looked splendid in their green blazers and grey flannel trousers. The breast pockets bore the Nigerian Football Association monogram badge. Beneath it was the inscription ‘United Kingdom 1949’. Forever afterwards this team was known as the UK Tourists. and one or two of the Hamlet side. The lack of boots could not cope on Wealdstone’s wet surface when the representative team of the Athenian League were met a few days later. The eight nil scoreline suggests a totally one sided affair but I doubt if that was a true picture. The FA Amateur Cup holders Bromley were up next and another bumper crowd of 10,000 plus gathered at Hayes Lane to witness a 3-1 win for Nigeria. Daniel Anyiam, Hope Lawson (from a penalty) and ‘Thunder’ Balogun were the scorers. Centre half Anyiam was soon to take over the captaincy of Nigeria for the following decade. The final game was another curiosity, and the first in which a Nigerian team played under artificial lighting. Hosts South Liverpool FC had just erected permanent floodlights in their Holly Road ground and invited the tourists to officially open them. The Cheshire League club was the poor relation on Merseyside, and the only way they were going to attract fans away from Anfield Road and Goodison Park was to play their home matches on a Friday evening. For this unusual friendly a record 13,000 turned up after work to watch history being made. It was just a shame about the state of the pitch, which began to break up badly as the game progressed. To save the occasion, a ball painted white was used so it could be seen clearer in the mud. The turf once again affected the shoeless who found it difficult to keep their footing. Despite the conditions they led 2-0 at the break but eventually drew 2-2. It was rather fitting that they completed their tour where they began it a month earlier. The ‘coloured’ population in Britain at the time was approximately a quarter of a million, and about 8,000 black people took residence in the shabby Victorian end of South Liverpool. It would be interesting to find out what percentage of the large crowd on that floodlit night was non white. They sailed away from what they would have regarded as the ‘mother country’ back to their homes and jobs in Lagos and its surrounds. But before they reached home they beat Sierra Leone in their first fully fledged international in Freetown. The Eagles were flying. As well as an exceptional footballer, Etim Henshaw was a natural born leader, a great motivator and regarded by all as a gentleman. And he decided to better himself with some further education in the UK. He combined studying Marine Engineering at Cardiff Technical College and playing for the local amateur side the Cardiff Corinthians. 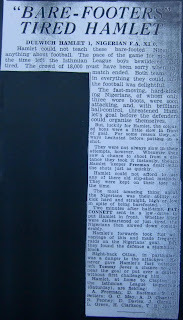 Another man to return was Nigeria's golden boy Titus Okere who signed for Swindon Town in 1952. Tesilimi ‘Thunder’ Balogun the brilliant inside right was one of the most successful Nigerian players of his generation. The Railway club he played for totally dominated in Lagos, winning many trophies. He returned to the UK in the mid fifties and signed for Peterborough United and then Queen’s Park Rangers. Today, in Lagos there is a football stadium named in his honour. Sixty years after the formation of the national team, in November 2009, the current side, the self proclaimed Super Eagles booked its place in the World Cup Finals, the first to be held on the African continent. And then sadly just a few days later Etim Henshaw, the captain of those pioneers died in Calabar, Cross River State, Nigeria at the age of 89. Etim Henshaw a few days before he died.